In recent years, international brands are racing to secure partnerships with leading celebrities to reach Chinese consumers, especially the younger generations. The role of brand ambassadors is becoming increasingly important for establishing, maintaining and promoting a brand’s image. A wrong choice in ambassador can have a damaging effect on a brand’s reputation. Below is a list of rising stars who are favored by international brands. Despite all the controversy over fashion powerhouse Christian Dior’s decision to appoint her as brand ambassador to China, Yang Ying, who is more commonly known as Angelababy, is undoubtedly one of the most popular celebrities in China and should be put on the watch-list for brands eyeing the Chinese market. In 2014, a study by consulting firm R3 and data-analytics company Bomoda showed that Angelababy was one of the top stars boosting luxury brands on WeChat. Her name was mostly associated with mentions of Dior, Gucci and Givenchy. And a recent report showed that Dior was the most relevant brand among the young Chinese (age 15-24) proving that Angelababy was a smart move. Chinese actress Ni Ni first rose to fame playing the role of Yu Mo in the 2011 film The Flowers of War directed by Zhang Yimou. She has since been known for her role in the Chinese-French film, The Warriors Gate and various Chinese productions like Run For Love and Suddenly Seventeen. Perhaps this explains why Ni Ni is a rising star among many international brands. In January this year, luxury brand Gucci name Ni as its new ambassador for eyewear in Asia. So did Tiffany & Co. who ended up partnering with Ni to promote its jewels in China. Ni was later invited to Tiffany & Co.’s Blue Book Gala in New York city, attended by international stars such as Jennifer Hudson, Claire Danes and Reese Witherspoon. Li Yuchun, aka Chris Lee, may be known to many as a Chinese singer and song-writer since her claim to fame is winning the Chinese singing content Super Girl in 2005. But Lee, who grew up in a small village in China, has gradually and successfully transformed herself into a rising fashion model for international luxury brands. Lee has signed deals with, among other brands, Coca-Cola, L’Oréal and Givenchy. Her distinct look — that of a high-top-sporting tomboy with a pixie cut — may be part of the reason why she managed to steal the show from many supermodels and become Givenchy’s “unofficial muse.” The fashion powerhouse invited Lee to star in its Autumn/Winter 2015 campaign by Riccardo Tisci, alongside industry icons and models including Donatella Versace, Candice Swanepoel and Frankie Rayder. Tisci even designed special looks for Lee’s concerts and the legendary Karl Lagerfeld has shot her for “The Little Black Jacket” book. Last year, Lee also became the face of Gucci in Asia. Lee is said to be selective in her fashion style. Suits are one of Lee’s go-to outfits while couture pieces are reportedly her top choice for big events such as the Cannes Film Festival. Liu Wen, a former Victoria’s Secret catwalk model, has emerged as everyone’s favorite “girl next door.” Fans have connected with her sense of humor, approachability, energy and positivity, which she displayed in her appearance on China’s television show We Are In Love and on her popular Instagram account. In addition to her mass fanbase, Liu Wen is welcomed by designers like Anna Sui and Phillip Lim, who rely on her to bring glamour to their collections. The powerful industry idol Wendi Murdoch counts her as a friend. So far, Liu has partnered with many international luxury brands including Louis Vuitton, Coach, Tory Burch, Tiffany & Co. and Estee Lauder. Born in 1986, Yang Mi is currently one of the most well-known actresses in China. Yang made her acting debut in the historical television series Tang Ming Huang but what propels her to widespread fame is her role in a 2011 television show with a time-travel theme called Palace and movies including Tiny Times that showcased the luxurious lifestyles of the young, urban rich. While the Chinese online community doubts whether Yang is graceful and elegant enough to be the face of high-end brands, she is indisputably a hot commodity among luxury brands in China. She has a huge fan base among millennials (she has over 73 million followers on Weibo), as Jing Daily previously reported. Recently selected to be a brand ambassador for Estée Lauder, she has also worked with Gucci, Louis Vuitton, and Miu Miu. In China, you can hardly find a single person who has not heard of the name Fan Bingbing. The Chinese actress is commonly referred to as a “goddess” and some fans have even taken their worship so far as to try and copy her appearance through plastic surgery. Fan grew in popularity through her hit television series My Fair Princess and most recently in films including The Matrimony, Lost in Beijing, Buddha Mountain, and the latest one, which came out last year, I Am Not Madame Bovary. International audiences may recognize Fan from the movie X-Men: Days of Future Past. Just this May, Fan attended the 70th annual Cannes Film Festival as its jury members, along with global superstars including Pedro Almodovar, Will Smith and Jessica Chastain. Fan is the darling of top global luxury brands. Her lucrative list of endorsements includes Louis Vuitton, L’Oreal, Chopard, Cartier, Mercedes-Benz, and Moët & Chandon. Many consider her Louis Vuitton’s favorite Chinese actress. The fashion powerhouse has been in partnership with Fan since as early as 2009. In the past few years, Fan has been invited to a number of important events by Louis Vuitton, including the brand’s 2018 Cruise Collection in Japan in May 2017, where she was was seated in the front row with international stars such as Sophie Turner and Jennifer Connelly. In 2014, Fan was listed in first place on Forbes’ list of the Top 100 Most Influential Chinese Stars, overshadowing prominent figures from mainland China, Taiwan and Hong Kong including Andy Lau, Zhang Ziyi and Jackie Chan. Fan is the only Chinese actress on The World’s Highest-Paid Actresses 2016 list ranked by Forbes. She may be more established than most other brand ambassadors on the list, but her star is ever-rising. Tang Wei shot into fame with her role in Lust, Caution, a 2007 spy flick by Taiwanese-American Director Ang Lee. Although the award-winning film, due to its political sensitivity, had caused her to be banned from Chinese media coverage for almost three years, she has been frequently spotted on screens from theaters to television ads in recent years, including for the popular rom com Finding Mr. Right. Tang is known for her good looks, elegance and endurance. In 2014, Swiss luxury watch brand Rado named her as brand ambassador, precisely because of these qualities and, perhaps ironically, her down-to-earth personality. Tang has been endorsed by many other renowned international brands including SK-II and Armani. Born in 1992, Andy Yang, or Yang Zi, started her acting career in 2005 as a child star in the Chinese sitcom Home With Kids. But Yang is no kid any more. Since last year, Yang has gained a new round of popularity thanks to Ode to Joy, China’s hit television drama about five young women making it in Shanghai. The show reached an astounding 10 billion views when the first season launched in April 2016. Yang played the role of a small-town girl with dreams about the big city who is into affordable Chinese and international brands and occasionally luxury fashion pieces such as a Furla bag. Fashion outlooks and luxury brands are a frequent topic of the show, which probably helped Yang win the brand ambassador role for the LVMH-owned luxury cosmetics brand Benefit. Yang has always been portrayed as cute and humorous. Yang is the first ambassador for Benefit since the company entered into the Chinese market 10 years ago. Another popular role in Ode to Joy is that of Fan Shengmei, played by Jiang Xin, or Rulu Jiang. In the show, Fan is a human resources staffer at a foreign company who desires a luxury lifestyle and aspires to be a “gold digger.” Fan wears clothes that feature big brand logos from Louis Vuitton and Lanvin to Chanel. In real life, Jiang Xin also works closely with international luxury brands including Givenchy. Her partnership with Givenchy dates back to 2011, when Jiang first rose to fame for her portrayal of Nian Shilan in Empresses in the Palace, a Chinese TV series that went viral and was acquired by Netflix. Jiang later shot a number of commercials for various products in Givenchy’s skincare line. Since 2016, Jiang has been appointed the spokesperson for the brand’s Le Rouge Perfecto lipstick line. Tang Yan, or Tiffany Tang first came into the public consciousness in her role as Zi Xuan in the 2009 Chinese television series Chinese Paladin 3, which was adapted from the video game of the same name. 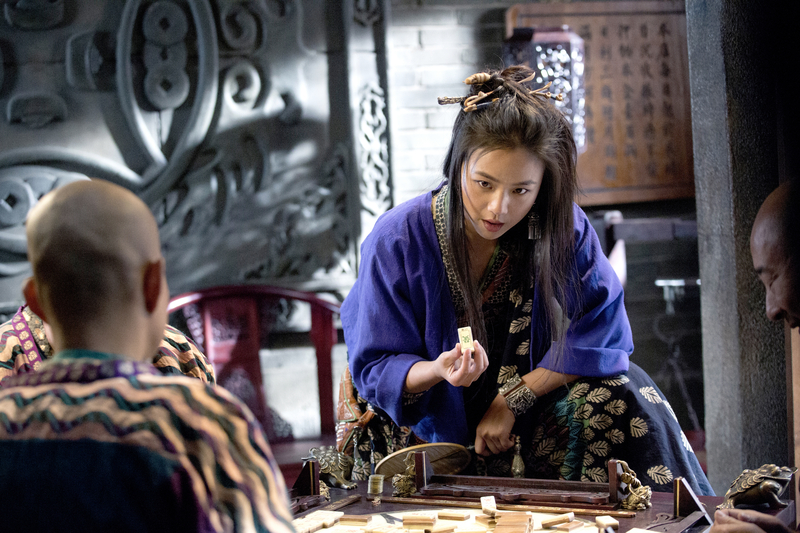 Tang and her chemistry with Wallace Huo Chien-hwa drew positive reviews from Chinese viewers. She also co-starred with legendary musician Jay Chou in the Taiwanese television series Pandamen. The 33-year-old actress has recently been named by Swiss luxury fashion brand Bally as its first Asia-Pacific spokesperson, a move interpreted by many as an attempt to reach Asian millennials. Before that, Bally had never tapped Chinese influencers for large-scale marketing since its debut in China in the mid-1980s. Tang is also a close friend of Yang Mi, who made fashion headlines for working with brands like Michael Kors and Mulberry.